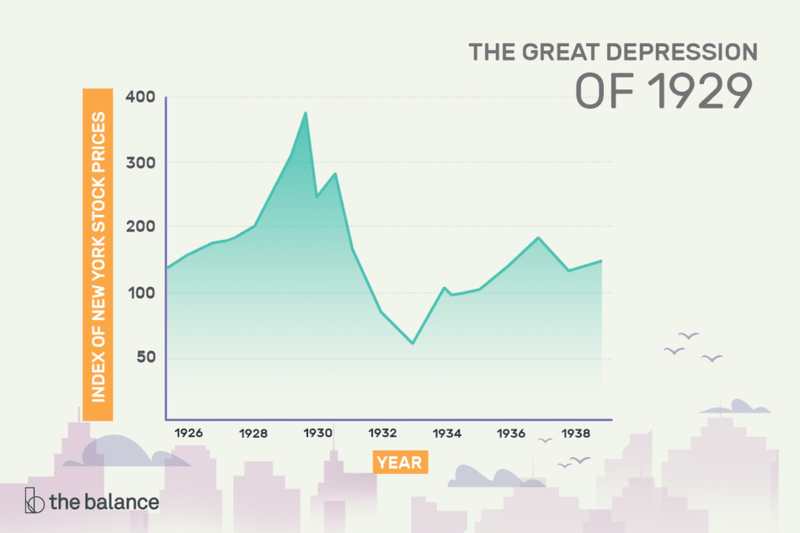 The Great Depression was a worldwide economic depression that lasted 10 years. It began on “Black Thursday," October 24, 1929. Over the next four days, stock prices fell 23 percent in the stock market crash of 1929. The stock market had been troubled well before October, however; in August of 1929, stocks were overvalued despite rising unemployment and declining production. As such, many people consider this the true starting point of the Great Depression. The Great Depression affected all aspects of society. By its height in 1933, unemployment had risen from 3 percent to 25 percent of the nation’s workforce. Wages for those who still had jobs fell. U.S. gross domestic product was cut in half, from $103 billion to $55 billion, due partly to deflation. The Consumer Price Index fell 27 percent between November 1929 to March 1933, according to the Bureau of Labor Statistics. Panicked government leaders passed the Smoot-Hawley tariff in 1930 to protect domestic industries and jobs, but it actually worsened the issue. World trade plummeted roughly 65 percent as measured in U.S. dollars between 1930 and 1932. Global financial distress had significant geopolitical ramifications. Hyperinflation and other economic woes in Germany, for instance, arguably contributed to Hitler's rise. The Depression caused many farmers to lose their farms. At the same time, years of over-cultivation and drought created the “Dust Bowl” in the Midwest, destroying agricultural production in a previously fertile region. Thousands of these farmers and other unemployed workers migrated to California in search of work. Many ended up living as homeless “hobos.” Others moved to shantytowns called “Hoovervilles," named after then-President Herbert Hoover. The Fed began raising the fed funds rate in the spring of 1928. It kept increasing it through a recession that started in August 1929. When the stock market crashed, investors turned to the currency markets. At that time, the gold standard supported the value of the dollars held by the U.S. government. Speculators began trading in their dollars for gold in September 1931. That created a run on the dollar. The Fed raised interest rates again to preserve the dollar's value. That further restricted the availability of money for businesses. More bankruptcies followed. The Fed did not increase the supply of money to combat deflation. Investors withdrew all their deposits from banks. The failure of the banks created more panic. The Fed ignored the banks' plight. This situation destroyed any of consumers’ remaining confidence in financial institutions. Most people withdrew their cash and put it under their mattresses. That further decreased the money supply. The Fed did not put enough money in circulation to get the economy going again. Instead, the Fed allowed the total supply of U.S. dollars to fall 30 percent. Later research has supported parts of Bernanke's assessment. In 1932, the country elected Franklin D. Roosevelt as president. He promised to create federal government programs to end the Great Depression. Within 100 days, he signed the New Deal into law, creating 42 new agencies. They were designed to create jobs, allow unionization, and provide unemployment insurance. Many of these programs still exist. They help safeguard the economy and prevent another depression. New Deal programs include Social Security, the Securities and Exchange Commission, and the Federal Deposit Insurance Corporation. Many argue that World War II, not the New Deal, ended the Depression. Still others contend that if FDR had spent as much on the New Deal as he did during the War, it would have ended the Depression. In the nine years between the launch of the New Deal and the attack on Pearl Harbor, FDR increased the debt by $3 billion. In 1942, defense spending added $23 billion to the debt. In 1943, it added another $64 billion. While anything is possible, it's unlikely to happen again. Central banks around the world, including the Federal Reserve, have learned from the past. There are better safeguards in place to protect against catastrophe, and developments in monetary policy help manage the economy. The Great Recession, for instance, had a significantly smaller impact. But monetary policy can't offset fiscal policy. Some argue that the sizes of the U.S. national debt and the current account deficit could trigger an economic crisis. Experts also predict that climate change could cause profound losses.